On June 20, 2016, the longest day of the year, people across the globe will join together to raise funds to fight Alzheimer’s and to honor those facing this disease. JOIN THEM! Teams are encouraged to create their own experience as they fundraise and honor those living with Alzheimer’s by participating in an activity they love. Choose an activity and put your passion to good work – swim, dance, knit, paint, play Bridge, cycle, climb a mountain, read. The options are limitless! On-line registration opens December 1, 2015. The $15.00 Early Bird registration fee ends February 28, 2016. The registration fee will be $20.00 beginning March 1, 2016. 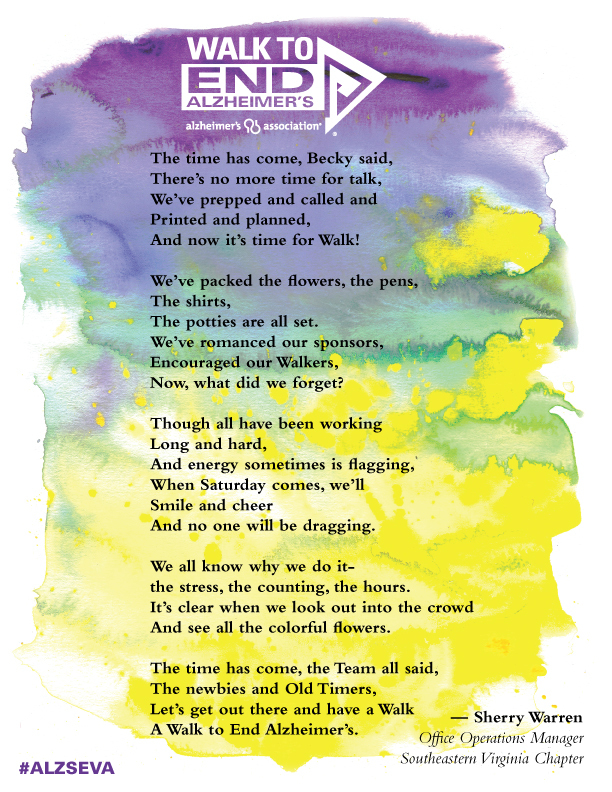 To start or join a team, visit http://www.alz.org/thelongestday. You can also help by volunteering to become a Team Task Force member. For information about this and for additional information about The Longest Day, contact Christine Warfel at cwarfel@alz.org or 459-2405. What is The Longest Day®? The Longest Day is a team event to raise funds and awareness for the Alzheimer’s Association®. Held annually on summer solstice, the duration of this sunrise-to-sunset event symbolizes the challenging journey of those living with the disease and their caregivers. Teams are encouraged to create their own experience as they fundraise and participate in an activity they love to honor someone facing the disease. Grab your friends, family and co-workers and form a team. You don’t have to live in the same city or state — or even the same country! Don’t be nervous to ask others to get involved – you’ll be surprised how many people have been affected by Alzheimer’s and want to join the fight. On The Longest Day, select an activity you love — or honor a caregiver, or someone living with or lost to the disease, by selecting his or her favorite hobby. You’re limited only by your imagination. Every team is asked to register and raise a minimum of $1,600 to further the care, support and research efforts of the Alzheimer’s Association. Fundraise leading up to and on The Longest Day. We’ll help with coaching, tools and advice! From sunrise to sunset, The Longest Day stretches 16 hours. Divide the day into segments and ask teammates to cover a portion. If you live in the same area, host an all-day event to cheer each other on. If your team members are in different locations, stay in touch with texts, tweets and Facebook posts. Gather your team — whether in person or virtually — and celebrate your accomplishments while recognizing the strength of those facing Alzheimer’s. a note from the editor: This should have been released at the beginning of Walk season but I was very busy. This was just too good not to post, so here it is. I walk for all the husbands who, like me, are loving and caring for their wives who will never be the same. 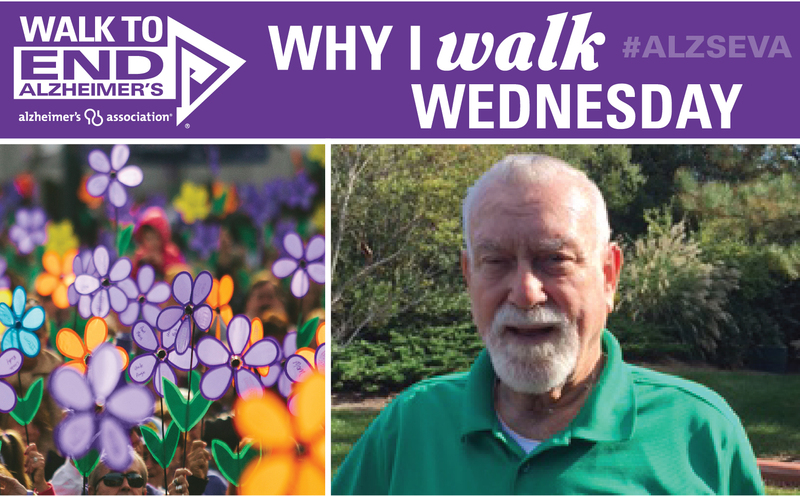 Together, we Walk to End Alzheimer’s, and individually, each of us is on a personal walk with this disease every day. My journey has taught me many things — mostly patience. Patience for the changes your loved one is going through, and how to constantly adjust to the “new normal” that your life becomes. Patience before you open your mouth to say something, knowing that you now have to find a completely new way of relating to this person you love. And knowing that the solution to a situation you discovered earlier in the day my not work as well even a few hours later. Just like with a race, it’s about going the distance – – and that takes strength. Physical strength to carry through with whatever is needed, and emotional strength to deal with the inevitable ups and downs that you, your loved one, and your family go through. And like in a relay, there’s the point where you need to pass the baton to others to carry things forward. I am truly blessed, in that I have a lot of help from caregivers and my family. Their assistance helps to sustain my strength. While my race is mostly run at home, my son and daughters also help carry the torch for me by participating in the Walk To End Alzheimer’s. One of my daughters is a marathon runner, so she strongly carries my hopes with her at this event. And our retirement community, Atlantic Shores, also bands together with a huge team to participate every year. People need to know about this disease and find ways to get their questions answered, and how to find support. In the Tidewater area, we are blessed with a fantastic Alzheimer’s Association. Their website was a wealth of information for me, and is a fantastic source for anyone searching for resources. Whether we actually participate in the Walk, or simply support it financially, we are all striving to reach the end of the race — a cure for this devastating disease.